Do you cherish your present moments? I mean do you really feel blessed to be who and where you are? I just returned from my hometown, Toledo, Ohio. The older I’m getting, it’s easier to live in my present moments. I’m aware of how precious they are. How precious the people in my life are. 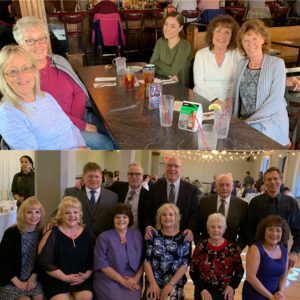 Shown in the photo above with me and Hale, are my parents, siblings and their spouses. We were at my niece’s wedding and reception. I must say, because I was consciously enjoying my present moments, I felt younger and happier. The other photo is a lunch I had with my daughter and my friends from childhood. I laughed at some stories that were told about me and us as children. The time we had together was so special. My parents are doing well and they are so much more youthful than a typical 87 and 89 year old! They cherish their present moments. They cherish their family, their good health and their over 68 years of marriage. And so much more! Their faith in God is strong. Their attitude is positive most of their present moments. They are a true joy to be around. We play cards and board games in the evenings and have for many years. Have you heard the saying, “Families that play together, stay together”? What do you think? Do agree with that? As I look back at my time there this past week, I feel each of my present moments were so precious. I got to be with my cousin, two days in a row, who also cherishes her present moments and shows it. Just last summer, she was in a comma, with a tracheotomy and on a respirator. This lasted for quite awhile. She’s better from the illness now, still in physical therapy and recovering. She gets emotional quite often. I told her that her tears help to cleanse her. I’m thrilled to have spent time with her. You don’t need to have a near death experience to cherish your present moments. I know with awareness and slowing down, comes appreciation of who you are and what you have in your life, as often as you can. When you do this, your love you feel for your life and others, is deeper and stronger. I don’t want to leave this earth having lots of regrets. I choose the majority of my time to not be in a hurry. As you slow down and become more organized in your day, you’re better able to cherish your present moments. Regrets you may have will become less. I hope for each of you reading this article, you’ll begin to become aware more often of all of the amazing things you have in your life. How amazing you are. Lots of people would think its conceited to think of yourself as amazing. In the way I am thinking about it, it’s about appreciating yourself and all that you are and have. Send me a comment with at least one thing you cherish. I would love for you to let me know how often you cherish your present moments! PS. 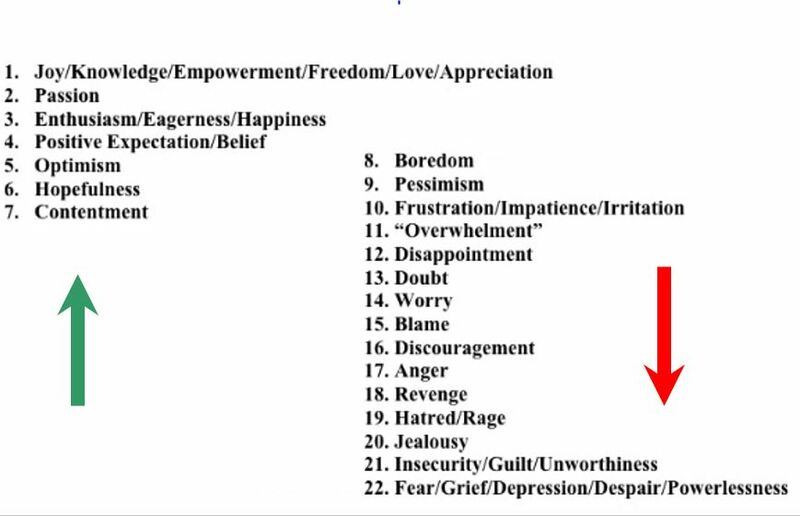 Here is the Emotional Scale again as a reminder of what your feeling. It helps increase your awareness. Print it and look at it often! It’s wonderful how we appreciate more as time goes on. I hope the youth of today cherish each moment instead of waiting, like I did.